Firstly, as the studio is not PITCH black (yes 1Rebel, I'm talking to you! ), not only can you actually see what you are doing, but the instructor has full view of you too. The classes are kept small (15 people max), which means they can therefore come round and correct your form. Not only this, but as the instructors get to know you, they also know when you're not working your hardest, and will push to the max until you do so.... trust me, I speak from experience! 17.5 kmph sprints - told you, pushed to the max! Finally, once you're off the treadmill and onto the floor, rather than fiddle around adding weights to your bar, dropping one off, adding to many and killing yourself, etc - Sweat 1000 uses the rig for all the strength training work. Burpees, pull-ups, ball slams, battle ropes, jump squats, etc, all performed in a circuit, not only are you kept going all the way through, but it's so much more fun than monotonously pushing a bar up and down! The cult classic, and still one of my fav's! Psycle decided to sort that out! Designed as a 'full body workout' on a bike, Psycle is high intensity, low impact, and SUPER effective. With the workout performed wearing cleated shoes to engage the hamstrings and calves, and hand weights slotted on to your bike to be used in the 'upper body' tracks, with blaring music, flashing lights and THE most energetic of instructors, you basically feel like you're parting in a club..... only this endorphin high is one that's not down to alcohol! A similar vibe with the cleated shoes and the hand weights, only marginally missed out on the first place spot! Who said building strength could only be done by lifting boring weights?! Not only can bodyweight exercises often actually prove more beneficial (as they tend to involve more of the stabilising muscles as opposed to one muscle in isolation), but they're so much more fun as well. Especially when there's bars and ropes involved! 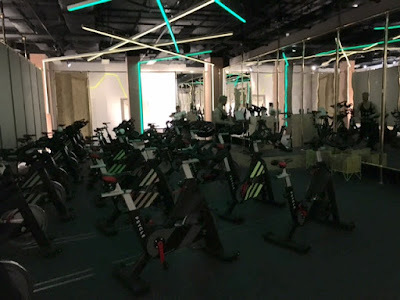 Exclusive to the Marylebone Third Space, Bars and Ropes is set in the retro gym which, as the name suggests, is reminiscent of an old school PE hall. On the bars, it's a variety of upper and lower body exercises, all designed ultimately to give you strength necessary to go on to climb the ropes. What's great about this class is you're not only getting a full body workout, but you're also learning what is effectively a new skill. When I joined, I didn't know where to begin climbing, but within a few weeks I was rocking my way to the top, as have many 'newbies' to the class since.... it's always so great to see just how quick everyone progresses! 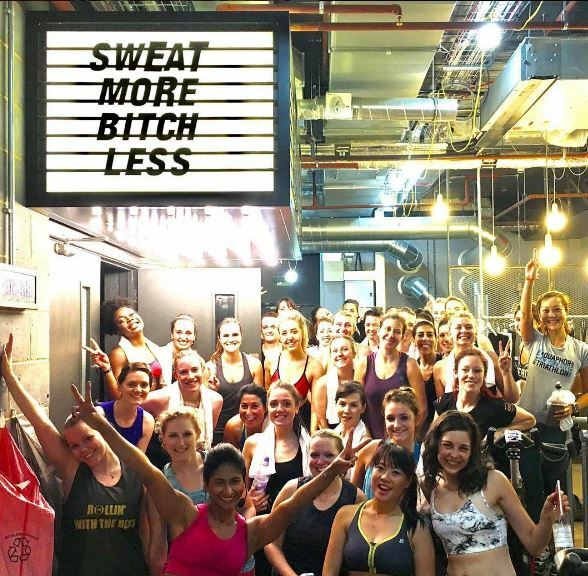 HIIT and resistance training combined, this Notting Hill studio really was like gym class, as we competed against one another in groups. Great fun, especially if you've a competitive side like me! OK, so yoga is a relatively new class for me this year. 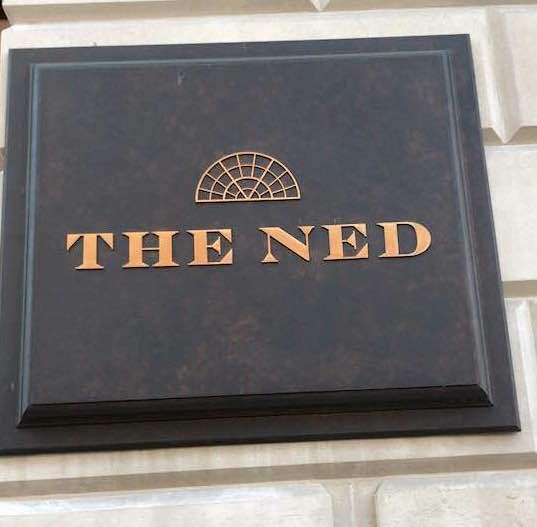 Although I'd tried it in the past, it had always been half-heartedly and somewhat reluctantly, and I never really got the point of it. Sitting there, 'breathing', just got me frustrated. As far as I was concerned, it was not exercise! Making up my own poses! Yoga at Another Space, however, most definitely is. 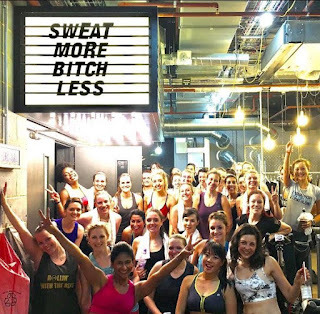 Nestled down a quiet street in the heart of Covent Garden, the studio specialises in three classes - HIIT, Cycle and Yoga - all of which are as brilliant as each other. 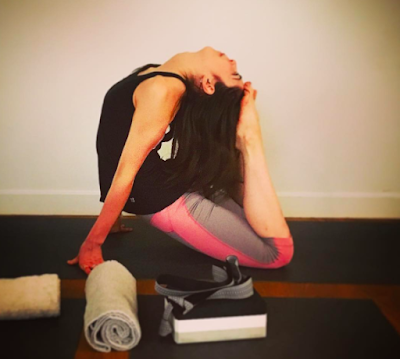 What I love about the yoga, however, is although there's still a strong focus of awareness of the breath, posture, flexibility and balance, there's just as much attention given to building strength. Chris, the master trainer (and still my favourite), really focuses on building strong bodies, muscles and minds. With a class performed to strong words, moving music and ambient scents, if I didn't 'get' yoga before, I certainly do now. 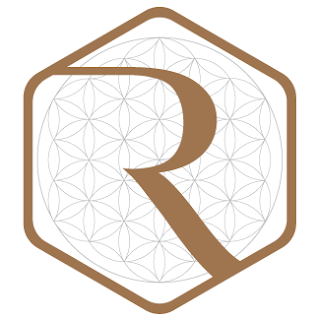 A MUST try for anyone interested in exploring the world of yoga, no matter what your level, Chris offers options for all. The Another Space Santa Selfie craze! With an unbelievable amount of strength in such a tiny person, Anna Karide is truly awesome. 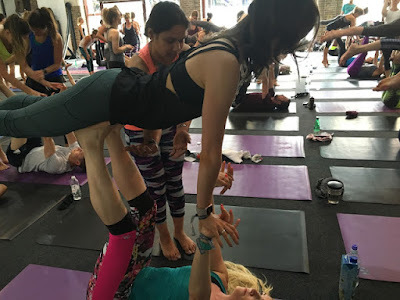 I first came across her Acroyoga at the Lululemon Sweat Life festival, where a fully booked class of over 300 people trialled out some of her acrobatic style poses! 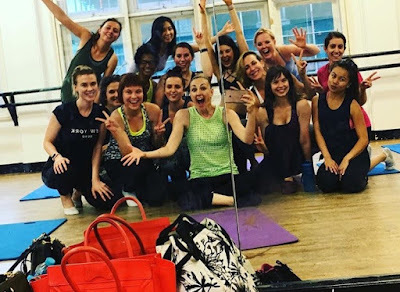 Yes, Barre in my GO-TO class of 2016 and, having tried out pretty much ALL the studios and instructors around London, there is one girl who tops it all - NYC fav Ashley Yeater. A previous performer on Broadway, Ashley recently brought her cardio barre concept 'Define' to London - and has been killing it ever since!! Repeating her mantra of 'work it, exhaust it, and stretch it' - that's exactly she has us do, along to fun, upbeat music. With the crazy little catch phrases and sayings she comes out with, I've never met someone who can make me work out and laugh so much all in the one session. Now THAT's value for money!! 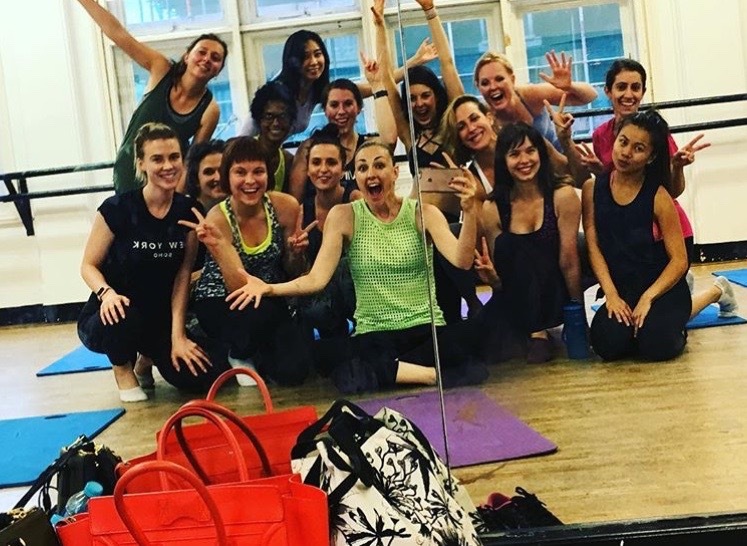 Even after an intense class, look how much we're all still smiling! 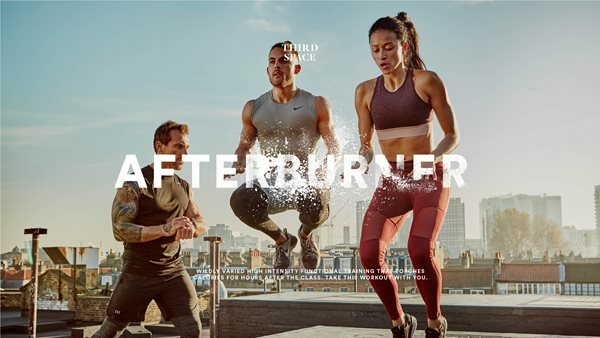 With their own studio having launched in Marylebone High Street, although there are a number of trainers that are good, it's owner Catie Miller who really gets you blasted. Make sure you book with her! And there it is - the best of 2016, all in one blog post! Have you tried any of the classes above? All of them? None of them? Having tried and tested the majority of the London fitness scene, these are the ones I'd recommend you get on your list PRONTO for 2017!! Drop 30 Pounds in 8 Weeks?